6626 Franklin Ave., via Google Street View. Hollywood, California, exploded in population during the late 1910s and early 1920s with the influx of moving picture companies arriving in town and people looking to work in the industry following suit. Originally a quiet, rural, farming community, Hollywood quickly grew more urbanized, with an increase in density. Many people did not own their own homes during this period, renting single-family residences as well as apartment units from others. Subdivisions in the foothills began opening to cater to the more affluent new residents. Bungalow court apartments opened, appealing to middle-class singles and couples looking for somewhat independent living. Apartment houses were rushed into construction, replacing the family boarding houses that had dominated the scene. A postcard for Chateau des Fleurs, listed on EBay as Buy It Now for $9.95. As Hollywood became a mecca both for bi-coastal actors and upscale tourists, it required more luxurious rental opportunities. Developers began constructing elaborate, lavish apartment-hotels to appeal to these people, offering long-term rentals for those looking for something more permanent, or a pied-à-terre while visiting the city. Among these establishments in Hollywood were such pretentious sounding buildings as the Fontenoy, La Leyenda, Hollywood Tower, Chateau Elysee, and the Chateau des Fleurs. The Chateau des Fleurs, located at 6626 Franklin Ave. at the top of Cherokee Avenue, grew out of the investment needs of Carl and Winifred Raab as a way to diversify and grow their saving. Carl Raab, born February 5, 1873, was the first white child born in what is now South Pasadena, son to German immigrants who established a successful dairy and creamery. Raab worked as the manager of his family’s creamery. After the death of his first wife, he married his second wife Winifred and saved his money. In the mid-1920s, the Raabs began looking for a way to draw more income by investing their money in real estate. They purchased a residence at 6626 Franklin Ave, the former home of directors Jack Conway and Howard Hawks, upon which to construct a regal apartment hotel. Per the February 2, 1927, building permit, Raab intended to build a $275,000 four-story, fifty-unit apartment hotel, with concrete foundation and exterior, wood and plaster interior, wood floors, and slate roof. Twenty-five tons of steel and 500 bags of cement would be needed for construction of the 96’6” x 149’6” building, sixty feet tall at its highest point. An ad in The Times, Sept. 23, 1927. Architect Meyer-Radon Brothers designed a French Normandy-style Class C building containing 137 rooms and 50 units to be constructed by John A. Platt Construction Company at the former location of an eight room, two-story house. The July 17, 1927, Los Angeles Times featured a story on the soon-to-open building, describing how its interior and setting evoked the French Norman style through furnishings, decorations, and natural stone fireplaces. All of units contained electric ranges and refrigerators, along with complete soundproofing. An August 10, 1927 advertisement called it “the ultimate in luxurious comfort, smart distinction, and perfection in service.” It noted that a descriptive booklet was available for those looking for more information. On September 24, The Times announced the grand opening that day of the one month delayed building, with a reception featuring music and refreshments from 2 p.m. through 11 p.m. Manager William Danielsen, experienced in running French and continental European hotels, saw to every resident’s need. The story noted the “elegantly furnished apartments” and “luxurious hotel accommodations,” combining old world charm with up-to-date amenities. Each of the fifty units, a combination of single or double units, featured its own exclusive furniture and design in the French Normandy style, with authentic carvings of peasants. Drawer pulls and hardware were authentic reproductions of peasant art as well. Guests entered through an outdoor patio landscaped with flowers and shrubs containing an open fireplace and an ornamental pool lit up at night. The interior lobby featured a rough wood-timbered ceiling and a large fireplace. The club and music room adjoined the lobby, with an elaborate grand piano decorated in the Normandy style. Each unit contained electric ranges and refrigerators, with each refrigerator containing a water cooler holding twenty glasses of water. Electric heat operated by a button in each apartment warmed the units. Water softeners provided soft water at all times. Some apartments contained natural fireplaces and singles contained “disappearing” twin beds. Units featured oak floors, decorated ceiling beams, and carved wood knobs and pulls. All apartments contained tiled bathrooms, with separate compartments for bath, shower, and toilet. A canopied rooftop garden beckoned residents, featuring both sleek landscaping and outstanding panoramic views in each direction. A separate but fully enclosed children’s playground adjoined the terrace. An ad for Chateau des Fleurs in The Times, Aug. 10. 1927. The Chateau des Fleurs ran its own hyperbolic ad trumpeting the grand opening of the magnificent and plush building, stating, “Discriminating people who seek a home place that is delightfully different..where every detail of arrangements, appointments, furnishings and service is moulded into a consummate whole of infinite satisfaction and enjoyment.” They also noted all the companies who contributed to its opening, like Meyer-Radon Brothers, John A. Platt Construction Company, furniture from Roy Wertheimer & Co., landscaping by United Nurseries, linens and bedding from Pullman Linen Co., upholstering by Davis Upholstery Co., floor coverings by Thomas L. Leedom Co., draperies by Vermillion’s Drapery Studio, and bedroom, dinette, and living room furniture by the McClellan Manufacturing Co. The building featured a large staff for guests over the early years, with many listed in the telephone book. Mrs. Nellie Valentine managed the building in 1929 and 1930, Chester Coldwell ran the hotel in 1934, Mrs. Ethel Brooks managed in 1938, with Mrs. Gretchen Warner managing in 1942. Sami Powers acted as engineer in 1928, with Mrs. Emma Krueger serving as housekeeper in 1929 and 1930. Ilene and Minne Baling served as maids in 1930, with Dorothy Haman acting as telephone operator, O. H. Stenzel as engineer, and L. Weiland Jeide and Donald McIver as clerks. Ambitious showgirls and actresses like 1934 WAMPAS Baby Star Mary Wallace. Jean Fursa, and Velma Greschan also lived in the building, trying to impress with the residence as well as their beauty. Some, like music teacher Claude Fleming and Feodor Gontzoff, tenor, offered singing and music lessons out of their apartments. The People’s Opera Company operated out of the building in 1932 as well. The Chateau also advertised to those coming to visit the Olympics in 1932, as well as those coming for the winter from the East. By the late 1940s-early 1950s, many press representatives lived in the building. 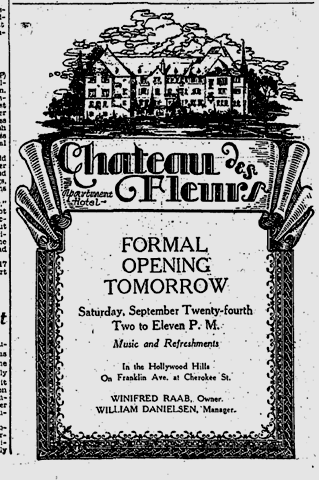 An ad for Chateau des Fleurs in The Times, Sept. 24, 1927. There were a few instances of notoriety at the Chateau des Fleurs. In 1931, resident and Hotel officer R. B. McConogue attempted to practice what Tom Lehrer preached in the song, “Poisoning Pigeons in the Park,” when he applied to the Police Commission for a permit to do just that, per the September 2, 1931, Los Angeles Times. The Commission turned him down flat. Mrs. Ruth Levi, visiting the building from New York in 1946, climbed out of her bathroom window and jumped down a ventilation shaft to her death on August 19, 1946. Ownership flipped over the years, and management attempted to keep up with changing interests, times, and tastes. On October 15, 1939, the Los Angeles Times reported that the J. E. Benton Management Company had been employed by Deposited Bonds and Shares Corp. to operate the Chateau Des Fleurs, along with other luxurious hotels in its portfolio like the Ambassador Hotel, The Gaylord, and the Park-Wilshire. A 1942 ad listed singles for $60 and doubles for $75, calling the Chateau Des Fleurs a luxuriously furnished abode, noting the building featured spacious rooms, all outside exposure, beautiful gardens and patio, modern roof gardens, and switchboard as amenities. As Hollywood changed over the next several decades, so did the building and its clientele. The building was not as immaculately maintained as it had been in previous years, beginning to acquire a somewhat aged dowager look. While some still worked in entertainment, most were just regular middle class people. Newer, more hip buildings arose around it. A 1978 ad for the building lists singles at $235 and one bedrooms at $275 plus utilities, calling the Chateau “an old classic building.” By April, the estate of Victor Nichols sold the building at auction in probate court to A. P. Lopez for $1.3 million, with the building now containing 16 singles, 23 one bedrooms, and one large bedroom plus den for the owners unit. A problem for more contemporary audiences , the story reported the building contained only 21 parking spots. The Chateau des Fleurs still stands at 6626 Franklin Avenue, a proud, gorgeous grand dame awaiting a refurbishing to return it to its glory days of the 1920s and 1930s. This entry was posted in 1927, Architecture, Hollywood, Hollywood Heights, Mary Mallory and tagged 1927, architecture, hollywood, Hollywood Heights, Mary Mallory. Bookmark the permalink. This was a great read! I currently live in one of the corner 1-bedrooms of this building and this post captured its history perfectly. There are few places in Hollywood where one can find an affordable apartment that feels luxurious (who knew a separate bath and shower would be so coveted?) and still carries that classic charm. I lived in the Chateau from 1979 thru 1982 (or 83?…) You may also note that teenage sisters, Olivia de Havilland and Joan Fontaine, lived in the building while just breaking into the biz. Not quite clear if their mother lived with them at the time. I met Olivia years ago, and we briefly discussed our living there. She was then filming A Midsummer Night’s Dream (1935,her first film, I believe) w/ Mickey Rooney and other film notables.